Radiation treatment is one of the main therapeutic modalities for the treatment of cancer. It succeeds in the eradication of tumours in many patients with the preservation of the vital functions of the nearby healthy organs. However increases in the success rate of treatment are still necessary and attempts to improve radiotherapy are continuously made as local tumour control and prevention of the metastatic spread are important requirements for the success of cancer treatment. Current practice in radiation therapy is based on the physical optimisation of the dose distribution, according to the anatomical information regarding the localisation and the extent of the tumour and the normal tissue. The routine planning in the clinical radiation treatment does not generally take into account the particular radiation sensitivity of the tumour of an individual patient or the spatial and temporal heterogeneity of the tumour. However, it is well known that these aspects may be the cause for treatment failure for a considerable fraction of the non-responding patients. The progress in imaging methods during the last decade has improved significantly cancer diagnosis and prognosis by increasing the accuracy of delineating target structures on a background of normal tissue anatomy and it has formed the foundation for 3D- and 4D-based radiation treatment methods. Among the imaging techniques, positron emission tomography (PET) has the advantage of being almost non-invasive since it uses tracers that are usually metabolic substitutes, versatile, as several tracers are already available for investigating various processes and quite sensitive since quite low concentrations of tracers could be imaged. The general aim of this research project is to use information from molecular and biological imaging methods in order to individualise the radiation dose delivery with high accuracy using advanced treatment planning techniques and, furthermore, to adapt the treatment depending on the responsiveness of the individual tumour. The protocol used in this project involves several positron emission tomography images taken for the same patient, two before the start of the treatment and one after about one week from the start of a treatment taking around 5-6 weeks in total. The treatment planning is performed based on the first two images and the assessment of the responsiveness of the tumour to the treatment which leads to the adaptation of the treatment is based on the third image. By addressing the critical issue of individual radiation resistance and treatment adaptation, this project is expected to lead to improved patient survival and increased quality of life particularly of advanced cancer patients. Indeed, preclinical studies have shown that dose escalation could improve local response, while the use of advanced radiation delivery techniques like Intensity Modulated Radiation Therapy (IMRT) could lead to a reduction of the dose burden and hence of the secondary effects in the normal tissues around the target. 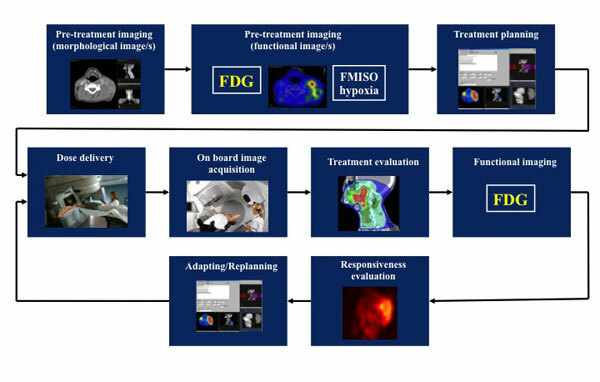 From this point of view, the use of imaging techniques to identify and target tumour hypoxia and other adverse microenvironmental factors while avoiding the irradiation of normal tissues will improve the treatment gain and will allow the individualisation of treatment by addressing the specific features of each patient. Furthermore, by reducing the treatment failure rates and the probability of local recurrences the apparently more expensive treatment caused by the use of several PET-CT images, will in fact be proven to be quite a cost effective personalised therapy approach by reducing the need for subsequent treatments.